This darn inline link. 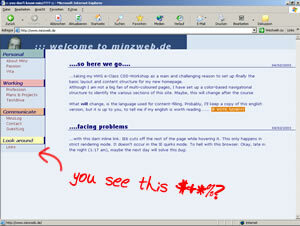 IE6 cuts off the rest of the page while hovering it. This only happens in strict rendering mode. It doesn't occur in the IE quirks mode. To hell with this browser. Okay, late in the night (1:17 am), maybe the next day will solve this bug. I'm not quite sure, but it has nothing to do with background-images, nor the different link-styles. The problem is, hovering the link IE re-renders the page and ends at the border of its containing block. So if the floated block on the left is taller than the content block, it will be cut off. Maybe it is because the floated block is considered to be out of the normal flow of the document. This doesn't occur if the left block was not floated and just displayed beneath the content block. But the oddest thing is, this only happens in strict rendering mode. I tried XHTML 1.0 Strict (cut off) XHTML 1.0 Transitional (cut off) HTML 4.01 Transitional with URI (cut off) and HTML 4.01 without URI (everything was fine). I think, now it's time for some techno-freaks to care about this problem. I really do have no clue about that. I am doing a workaround in simply making the content block taller than the floated block (just add some more lines ;).